I dont know what it is like in your house but it's late night TV for The Ashes in England and Le Tour de France! Alot of armchair travelling has been going on as we wind our way through the Swiss Alps and admiring the lush green mountains and quaint rural houses that look like Monopoly figurines randomly dotted on the country side. 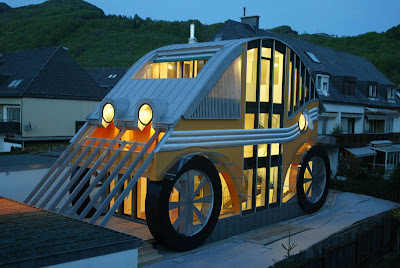 This Auto by Ing.M.Voglreiter house looks like a modern day chitty chitty bang bang but it is a renovated 70's house! What you do have to admire about the Tour is the comeback king Lance Armstrong - to be a winner for all those years, take a break, then a break-up (Sheryl Crow) and a new wife and family and be in the front pack of the tour is nothing but inspiring. I am hoping to be able channel a bit of that inspiration to getting off the couch (who am I kidding) for for the time being I'm pretty happy with the scenery! Learn how to book international flights for $100 instead of $1,000 by Travel Hacking. INSPIRATION FOR A BIT OF EVERYTHING!